The New York State Legislature has approved a measure known as the Dream Act that would offer college aid for children of undocumented immigrants. However, they stopped short of acting on a measure to offer driver’s licenses to immigrants in New York without documentation. Assembly Speaker Carl Heastie speaks just before the Assembly approved the Dream Act. Wednesday The family of the late Senator Jose Peralta, who was a champion of the measure, looks on. Assembly sponsor Carmen De La Rosa is on the right. 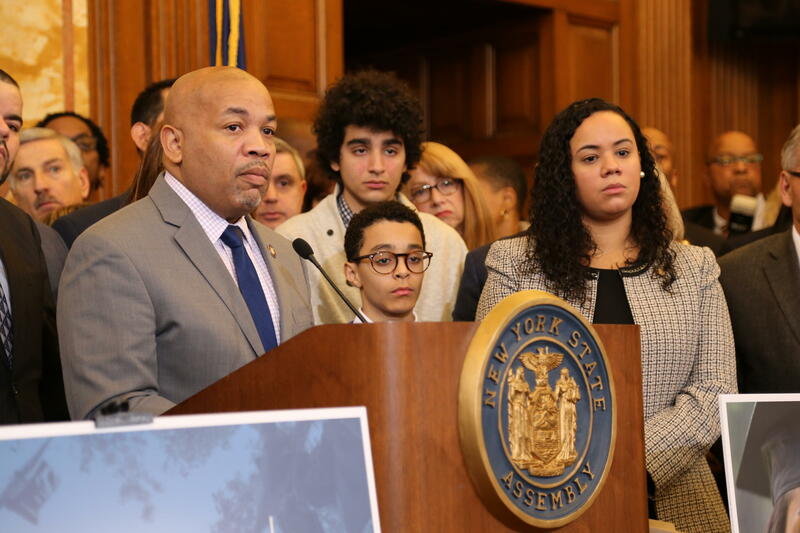 Speaking just before the vote at an announcement packed with young immigrants seeking to go to college, Assembly Speaker Carl Heastie celebrated the measure’s expected success. “Today we will pass the Dream Act for the ninth and final time,” Heastie said as the crowd cheered. Unlike in past years, when Republicans in the state Senate blocked the bill, Democrats who now lead that chamber also approved the measure and Governor Andrew Cuomo is a supporter. Assemblywoman Catalina Cruz was an active member of the Dreamer movement before she was elected to the state Assembly last fall. Cruz came to the United States with her mother when she was a child to escape the drug wars in Columbia. She overstayed her visa and was undocumented for 13 years, until she became a citizen when she married her high school boyfriend. She became a labor and immigration lawyer and on Wednesday, she said the law is one step toward eliminating the discrimination that undocumented immigrants face. The Dream Act was renamed the Jose Peralta New York State Dream Act, after the late senator who died suddenly of complications from acute leukemia at the age of 47 last November. Peralta, a Democrat from Queens, was a tireless backer of the Dream Act. He even joined the now- defunct Independent Democratic Conference in hopes of advancing the measure in the Senate. But that proved his political undoing, and he lost his seat in a primary last September. His wife, Evelyn Peralta, attended the announcement and witnessed the vote, along with her children. She said the issue was a “labor of love” for her late husband. GOP members in both houses voted against the bill. Sen. Robert Ortt, a Republican who represents a district in Niagara and Orleans counties and a small portion of Monroe County, said the $27 million in college aid to undocumented immigrants is not fair to middle-class New York residents who are struggling with college costs. He said many of his constituents have significant student loan debt. Assemblymember Steve Hawley (R-Batavia) also was against the measure. “We cannot possibly justify spending millions of tax dollars to line the pockets of those here illegally when the student loan debt crisis is a national epidemic, with an average debt burden of $39,400 per student," Hawley said. “We are a nation of laws and those who follow our laws, work hard and pay taxes are the ones we should be helping with college affordability." Hawley said the Assembly's minority have put forward other proposals to make college affordable that should have been approved instead. The Senate also voted to raise the family income eligibility for the state’s Tuition Assistance Program from $80,000 to $95,000 a year. The Assembly did not take up the measure. Heastie said it will be discussed as part of the budget. Immigrants’ rights groups are also seeking access to driver’s licenses for undocumented immigrants. The sponsor of the Dream Act in the Assembly, Carmen De La Rosa, said the measure is more than just a “box” checked off the agenda, and more needs to be done. That bill was not voted on Wednesday. Heastie said his Democratic members plan to discuss the issue soon.